At the Institute of Applied Medical Engineering, initial research for artificial hearts already started in the 1990s. A fully implantable Total Artificial Heart by the name of ReinHeart has been under development since 2009. With an innovative drive concept, the ReinHeart is designed to be a real alternative to a heart transplant. An interdisciplinary team of scientists, engineers and surgeons is working together to create a maintenance-free TAH, free of permanent percutaneous connections and small enough for implantation in the majority of patients. 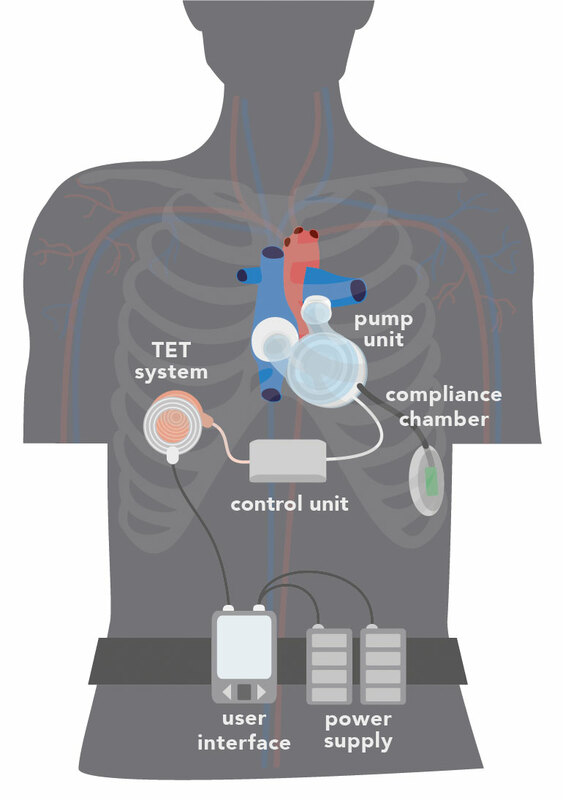 The main component of the ReinHeart system is the pump unit which completely replaces the failing human heart. It consists of an electromagnetic linear drive, which mimics the native heart function. The pumping chambers and the artificial valves imitate the function of the natural heart chambers. The drive unit is controlled by a separate implantable controller powered by an internal battery. A coil system attached to this controller allows wireless energy transmission through the closed skin to charge the battery. It consists of a receiver coil implanted under the patients‘ skin and a transmitter coil outside the body. The energy to power the system is provided by additional, externally worn batteries. Strict reliability requirements apply to the ReinHeart artificial heart system which must operate continuously without the need for repair after implantation. The durability of its critical components has been proven in extensive laboratory tests, which can be accounted to the minimal-wear design of the drive. Additionally, the size and form of the system have been optimized in anatomical fitting studies. The ReinHeart provides two major advantages for the patients: The use of the transcutaneous energy transmission system to charge the implanted battery eliminates the risk of infections caused by permanent skin incisions. Furthermore, the internal battery and the lightweight external components give the patients a high degree of mobility, significantly improving their quality of life. The functionality of the system has been tested in acute and chronic in-vivo experiments.